The first consultation between Ito Hirobumi (later to become the first Prime Minister of Japan) and William John Macquorn Rankine (then Regius Chair of Civil Engineering and Mechanics at the University of Glasgow) took place during the early period of Japan’s Meiji restoration; and this meeting marked the beginning of the fruitful relationship between Japan and the University of Glasgow, particularly in the field of engineering science. Ever since the 1870s, many Japanese students obtained their expertise at the University and later contributed to their home country’s rapid modernization. As part of my Club 21 internship with Glasgow University’s Great War Project in the University of Glasgow Archives, I have come to discover that this flourishing relationship kept alive around the time of the First World War, too. In 1914, Japan allied itself with Britain and the Entente Powers, providing naval support and taking action against Germany’s Pacific territories. On the occasion of the centenary of the First World War (2014-2018), Glasgow University’s Great War Project is providing a deeper understanding of the University’s experience, by sharing stories of its alumni and staff members who lived during the wartime. As an international student from Japan, I was offered a valuable opportunity to be involved in the project and received a fascinating assignment to research the Japanese students who studied here in Glasgow around the time of the First World War. Through my research, I have found that many of Japanese international students studied engineering science and later assumed important roles both at governmental organisations and private companies in relevant fields in Japan. Among many others, Taizo Shoda’s contribution particularly struck me. Born as a son of the general manager at the Mitsubishi Dockyard and Engine Works, and of the daughter of the company’s founder, Shoda came to Glasgow in 1911, just a few years before the outbreak of the First World War. In addition to engineering, he took many classes, ranging from mathematics, natural philosophy, physical laboratory, chemistry, and naval architecture. He also gained practical skills by working with the marine engineers at David Rowan & Co (later acquired by Lithgow’s Ltd in 1917) during his time in Glasgow. After obtaining a BSc in 1916, Shoda returned to Japan and started to work at the Kobe shipyard of Mitsubishi Internal Combustion Manufacturing Co. Shoda subsequently took many important positions in Mitsubishi and became one of Japan’s leading aero-engine designers. He eventually assumed a role of Executive Vice-President at Mitsubishi Heavy Industries, Ltd.
With his outstanding performance at the workplace, Shoda was appointed to multiple honorary roles at prestigious associations of the field in Japan. Between 1955 and 1957 he was a member of the Aircraft Production Council, an advisory body to the Government; from 1953 and 1958 he was Chairman of the Society of Japanese Aerospace Companies; he also served as President of the Japanese Aeronautic Association between 1962 and 1973 and was later offered the position of Honorary Vice President in 1981. Shoda’s accomplishment seems to have reached the ears here in Glasgow, too. 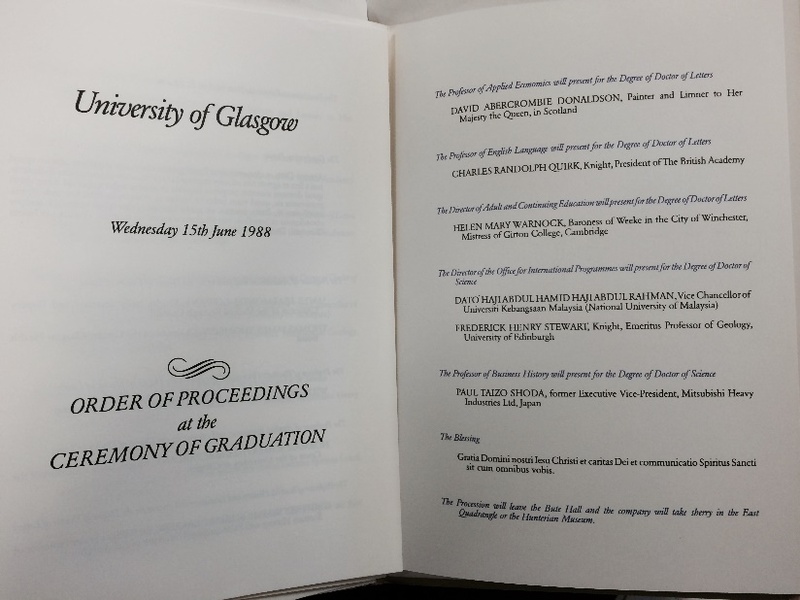 In 1988 the University conferred on him the Honorary Degree of Doctor of Science. The Shoda Chair in Aerospace Systems was also established in 1995, with a gift from his family and friends. His family members, colleagues, and friends also set up together an endowment in the following year. As a result, a Paul Shoda Memorial Prize was founded, and it has been annually awarded to the most distinguished undergraduate student in aerospace engineering since then. In this way, not only did Shoda contribute to his home country during his lifetime, but also he has continuously played a significant role in maintaining a high reputation of the department at the University of Glasgow. Among many other engineering students around this period, who associated with Japan, included Yoshinobu Katsura, Tsurumatsu Matsuo, Masaharu Robertson and Kobayashi Shunjiro. All of these students’ achievements display an active interaction between Japan and the University. In the meantime, it should be always remembered that many students studied arts subjects around the wartime as well. 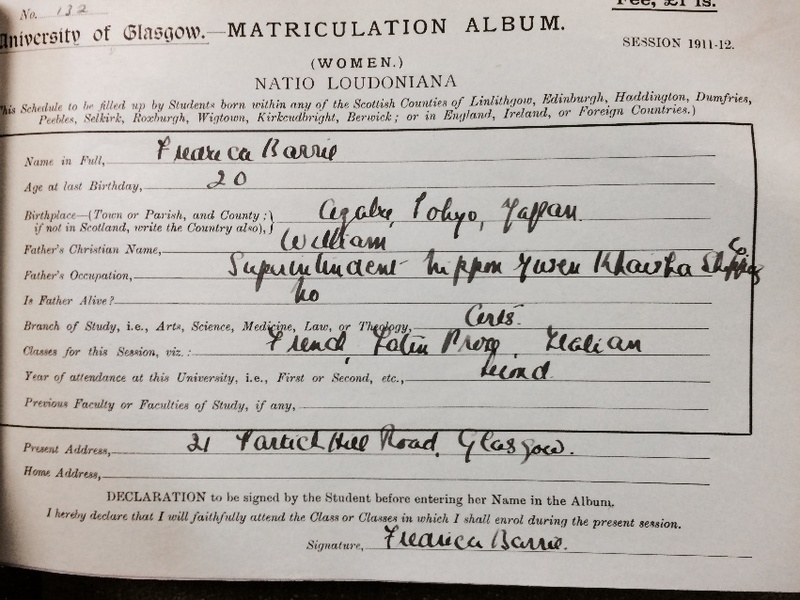 I came across the Tokyo-born/Glasgow-based female student, Fredrica Barrie. During her time in Glasgow, she excelled in many classes and received numerous awards, including Dr. Grillo’s Five-Guinea Essay Prize for her Italian excellence and First-Class certificates in French language and literature in her junior and senior years. She obtained an M.A. in Arts at the University in 1914. Archival materials tell many stories of the past, without which we would have never known. The Japanese students’ records here in the University Archive does demonstrate a significant connection between Japan and the University during the early 20th century. In the future, it is my hope that this fruitful relationship will continue and even more flourish in the fields of both science and arts. More detailed information on the historical exchange between Japan and the University of Glasgow, see the International Story webpage on Japan. By gugreatwar in Students on July 20, 2015 . Reblogged this on The University of Glasgow's International Story Blog.